Want 1000 pounds of LEGO plus 2300 Minifigs? If you have $20,000 and a yearning for over 1,000 pounds of LEGO bricks and containers, including over 2,300 minifigures, then there is an eBay auction with your name on it. Most of the sets are older – the seller mentioned they sold off the newer sets they had. If you’re within 500 miles of Frontenac, Kansas and do the Buy-it-Now option, you can even get it delivered to your doorstep if you work out the options with the seller. It’s all contained on one covered 6×10 trailer. Now, let’s cover what is here in this lot. Well, first of all every theme you could ask for. And pretty much every piece Lego has made. I spent years separating and organizing 1000’s of lbs of Lego. I weighed everything in their containers and it all came to around 1158 lbs not including the metal cabinet with Lego instructions. So, of course I have not accounted for the weight of the plastic bins. If you want go to Walmart and get the plastic drawer bins that look like mine and weigh them, go ahead. I think I have about 30 of them. 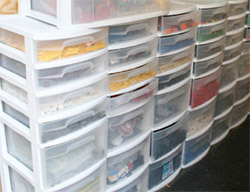 So, I am guessing that you should have about 1000lbs of clean, sorted, organized and even partially baggied Lego. Of course I did have a few bins I never got to for sorting, I will leave that to you. If you want better photos, check the PhotoBucket.com link below – there are over 1,000 photos of the LEGO pieces being auctioned. Many of the boxes (flattened of course) along with the instructions are included.